Take control of your disk space today! Reduce cost, proactively manage your disk space. Over the years, disk space has become less expensive, but programs and data files are expanding just as fast as prices drop on disc drives. No matter what, your drive space eventually gets used up if you don't have a solution to find and remove unwanted files. This slows your system and network down, user can't find what they need because of all of the clutter, and it's expensive and time consuming to maintain and manage ever increasing backups. DiskFerret is a disk space utilization tool that analyzes the files within a hard drive, network share, or folder, and provides charts and detailed information to help you understand where and how disk space is being used. 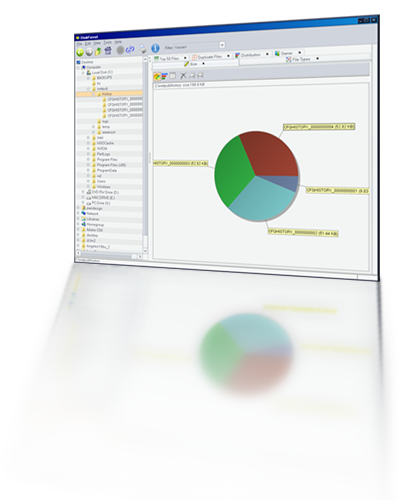 A variety of interactive charts are provided that allow you to quickly drill down and isolate files based on different criteria such as largest folders and files, oldest files, duplicate files, files by owner, and more. Once you've located the unwanted files that are wasting disk space, DiskFerret provides the tools to delete them, or move them into a zip file. DiskFerret will reduce your cost by helping you quickly find and eliminate old, large, unwanted, and duplicate data, or even help you identify which users are using the most space, using more than their alloted space, or storing inappropriate data. Email notification of low disk space conditions. Scheduled scans save you time.